In website builder WebWave you can set default parameters for all basic text styles. What's more, you can add your own styles. Any text style can be freely modified so, for example, you won't have to change the color of every new link on your website. All you have to do is set default links color. To modify a text style, enter website builder WebWave and in Settings panel go to Website and Text styles. What's more, if you ever decide to change for example color of default text on your website, with styles you won't have to do it by hand. All you need to do is enter the Settings Panel and in Text Styles change text color. Changes will automatically apply. 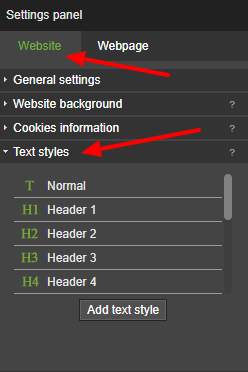 To add a new text style, go to Settings Panel, enter Website and in "Text Styles" select "Add text style". When you enter a name of a new style, you will see a text editor where you can set style parameters. When you are done, save changes in the Settings Panel. In this window, you can switch between RWD views - on which screen (Desktop, Tablet, Mobile) do you want to work on your project. You can set spaces between lines in a text. Set letter's background color. It is not a background color of the whole element, just letters. Set color, size and alignment of text shadow. Set a size of the spaces between paragraphs. Transform Text to Uppercase - Transforms all marked text to Uppercase. Transform Text to Lowercase - Transforms all marked text to Lowercase. Capitalize Text - Changes first letter in each word in a marked text to Uppercase and rest of them to Lowercase. first click - Uppercase, second click - Lowercase, third click - Capitalize, forth click - Uppercase etc. This button removes formatting and brings back a default style..